If your realtor company is in need for real estate sign post installation – you can count on us. Years of experience and hard work have shaped the best crew for all kinds of sign board installation jobs. We are efficient, punctual, and we make sure everything fits your time-frame and schedule. Our crew is adaptable and willing to work around your business hours. You will get a reliable service because we will make sure to install your real estate sold sign properly and on time. Your real estate sign post will remain straight and spot on, while it’s on your property. If you’re in the real estate business, you know how first impressions are important. Those real estate signs might just be the first thing a new potential customer will see. You also know that real estate sign installation is the best way to attract attention to your property. Commercial real estate signs need to be neat, clean, and up to standard. When you hire us, you don’t need to worry about these things. We are going to make sure that the image of your business is flawless. We also offer signs removal service, which is always a good news — it means the property is sold. Call us at (888)888-5715 or contact us to learn about all the options Graphic Installation provides. Since Graphic Installation Company opened its doors, we have literally installed over thousands of real estate directorial signs. Because we understand how competitive real estate market is, we are more than prepared to give you that edge. Once you pick our team, you will have one less thing to worry about, and one thing you can cross out from your to-do list. 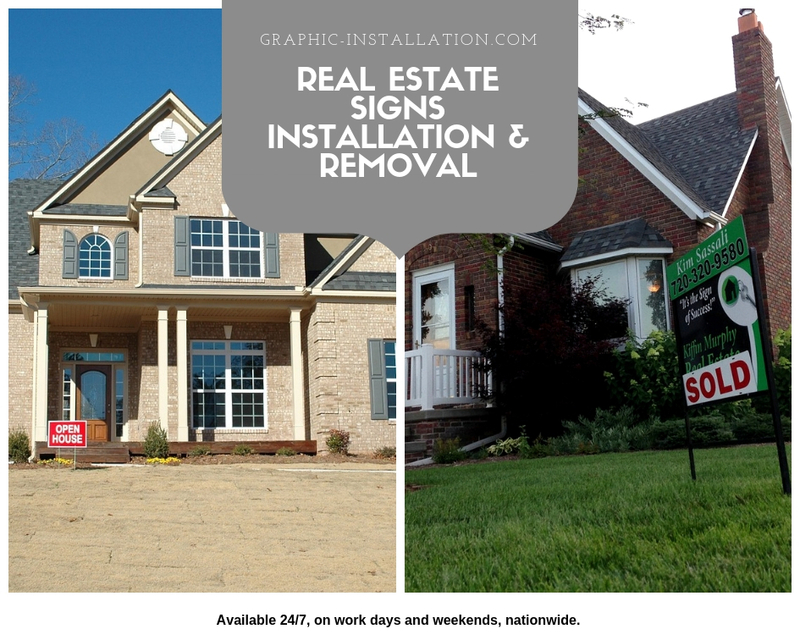 Based on the services you need, we will make sure to work in your time-frame, and we will be more than glad to do the removal of the old and installation of new real estate signs. We can also provide road side installation or any other service you might need. You will have a polished sign on every property you would like to sell or advertise more, and you can turn your focus on those lucrative sales. The math is simple when it comes to billboards and signs. Good quality signs attract more customers, which means you will have more inquiries and more walk-ins on the open house days. That is where we come in, to make sure all that effort pays out. If you need billboard sign installers or real estate signs installation, we are the best choice you can make. Depending on your franchise, we can accommodate services for both commercial and residential properties. Graphic Installation offers all year round service and quick response. One of the most attractive features our company provides is – safe and risk-free. Leave it all in our experienced crew’s hands, and you can cross out another business goal of your to-do list. No matter what your vision or ideas are, we have all the necessary equipment and years of experience behind us. High-quality tools and latest technology is high on our priority list. 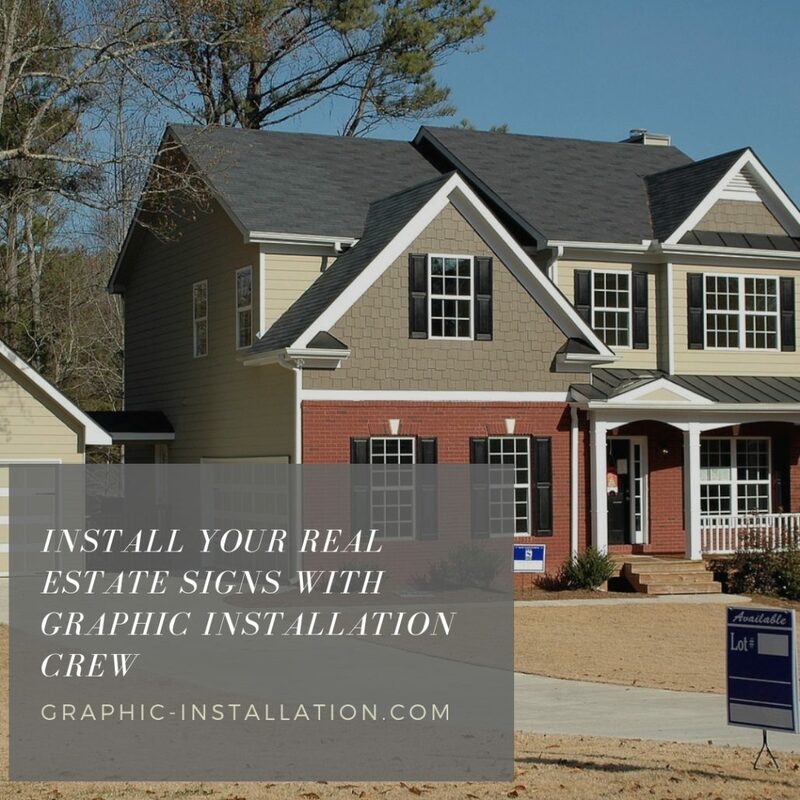 We are definitely your ”real estate signs near me” company because, besides NY, NJ, and Boston, we can install your custom real estate signs all over the U.S. The number one priority in Graphic Installation Company is that everything goes smoothly. That means safe and risk-free. We’ll make sure that commercial sign installation is also free of any kind of damage. If you invested your money in the best design and quality material for your real estate sign – you should be careful who are you giving it to. Proper installation should be handled by licensed and experienced professionals. Graphic Installation crew is going to make sure to install it with utmost care. As we mentioned before, our crew is more than ready to work around your daily schedule. Why are we mentioning this? Based on our experience, projects sometimes need to be done fast, overnight. This is what we are best at; performing overnight miracles that seem easy to accomplish but give amazing results. While in our safe hands, you won’t need to interrupt your daily routine. We respect your time and business and leave no loose ends. Happy to provide you with the best advice and professional opinion on how to make your real estate sign eye-catching, we are glad to share our expertise to help you succeed. Our real estate sign post installation services are well-priced, and our crew is more than happy to give you the estimate today. Contact us or call us at (888)888-5715 in order to get an estimate for your real estate sign installation project. We will explain our service in detail and you will see how far we are willing to go to make your business bloom. Real estate sign installation service we offer will fit your budget and take one important thing off your mind. One thing less to worry about and putting it in safe hands can sometimes be the necessary edge on the road to success. Graphic Installation Company will handle any installation task with the utmost care because your success becomes our success. We are happy to say that our portfolio includes numerous clients, many of which come back to us. When you provide a reliable and quality service, you can only have long-term clients. We are here to make sure the image of your company shines even on something as simple as real estate for sale signs are. Whether you are a homeowner or a local realtor business from NJ, NY, Boston or any other place in the U.S. we can be there for you because we offer our services nationwide. It’s time you focus on more important things and leave the time-consuming tasks in our safe hands. Our fully-equipped and experienced crew is always in good mood, ready to handle any installation task. We are nationwide real estate sign installation professionals, always ready for the challenge and always up for the task.